It’s become more than obvious, after an entire offseason spent away from basketball and the first significant injury of his career, that Dwight Howard is far from healthy. That sort of uncertainty and lack of confidence can affect all aspects of a player’s game, but when you couple that sort of trepidation with what could be charitably described as unimpressive effort, you have what could be an MVP-level anchor working as a saddening sponge instead. What you can’t criticize is his approach to free throws. He works at it, repeatedly, in practice. In actual practice during games, though, Howard stinks. 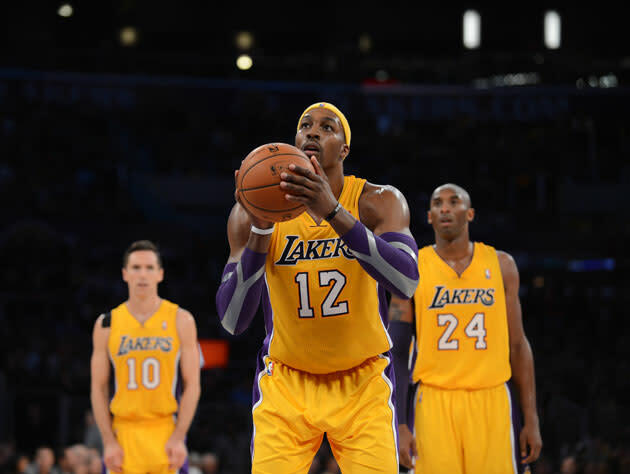 After perhaps his worst game as a Laker in a loss on Sunday, he’s at just over 51 percent on the season. The half-step back has resulted in some forward movement in precision. Howard had made 56 of 91 (61.5%) free throws over the 11 games preceding the Lakers' game against the Philadelphia 76ers on Tuesday night at Staples Center. That's a considerable uptick for someone who had previously shot 46.9% from the free-throw line this season and is a career 58.4% shooter. "The success can't be measured by numbers right now," Howard said Tuesday. "The success is measured by consistency, and for the most part I've been consistent." Of course, utilizing his previous stroke from right on the line, Howard was consistent great at free throws away from games. Via several accounts, he hit for well above his averages routinely in practice bouts during off days. As we talked about above this slight uptick in percentage could just be a random event, some reaction to better times (Steve Nash’s return, coaching permanence under Mike D’Antoni), or the bounce of the ball. Shooting just under 61 percent (counting Howard’s 5-10 work from the stripe on Sunday) in a career that has seen the big man shoot 58.4 percent can hardly be classified as a breakthrough. Stepping back, so to speak, from his work in December is necessary. The unimpressive early returns shouldn’t preclude Howard from keeping this up. Players line up on the free throw line because, legally, it’s the closest they’re allowed to shoot from while attempting those freebies. “Closer” doesn’t always translate to “easier,” though, as anyone who has had issues with their putting stroke and/or dart game can attest to. Toss in the height of these players, the fifteen feet worth of space between the line and the rim, and the ten-foot height of the goal, and you have a pretty tricky trajectory in spite of Kevin Durant’s career 88 percent mark from that angle. These are gentlemen that can just about touch the rim on a ten-foot goal while reaching from a standing position. In a lot of ways, asking pro players to put enough arc on the ball in order to make two-thirds of these things is ridiculous – and please leave your Monday morning quarterback analysis at the door unless you can go nail eight of ten right now. The ball leaves their hands at about the same height that the rim is perched at. With a flick of the wrist and a whole lot of touch, the ball has to carry through the air and somehow land at a height – 15 feet away – that it began at. The note that began – their superior height and wingspan – can also destroy. This isn’t excuse-making or an attempt at starting a groundswell to abolish the free throw for anyone above six and a half feet. It’s recognition of how strange the exercise is. It’s not just akin to asking pitchers to bat, because pitchers play defense against batters for a hundred or so pitches per contest, whereas Dwight Howard has never defended a free throw attempt in his life. It might be like asking Adrian Peterson to attempt the extra point, though. There are many aspects of Dwight Howard’s career to trash, and I personally spent probably around 20,000 words in 2012 alone ridiculing the Lakers’ center. While his substandard free throw shooting isn’t above reproach, it is understandable. It should be understandable to anyone who has ever failed to manage a four-foot hook off glass from the left low box, even if you can hit 17 out of 20 from behind the arc from the right corner. Sometimes physics and touch, no matter the practice time spent attempting perfection, just fail to combine to work out to something you can depend on. The guy’s arc needs some space to breathe, and develop. Over 120 years after this game was developed, it’s nice to see a player questioning the typical basketball orthodoxy. Even as we continue to question his off-court motives.